High on the list of plants that should be better known is this honeysuckle, Lonicera x tellmanniana. The ‘x’ in the name – if this baffles you – indicates that the plant is a hybrid, in this case between Lonicera sempervirens and L. tragophylla. These too are uncommon in gardens and would be worth growing (but be honest – how many honeysuckles do you really have room for?). Sempervirens has coral red flowers, tragophylla’s are yellow. Those of tellmanniana – larger than either – are a rich vibrant orange. It’s the absence of scent that has probably limited its popularity, but if you have a shady area I’d urge you to try it. Mine is climbing into an old apple tree and it adds an almost tropical touch as the light filters down through it – well worth the floor space. As it happens, my neighbours grow one of the scented ones, and this has wandered into my garden, neatly offsetting tellmanniana’s shortfall in that department. 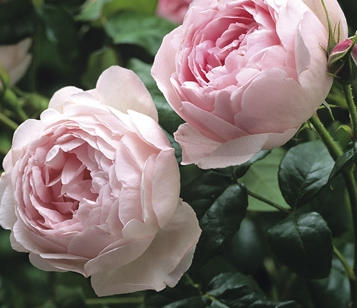 David Austin’s aim in breeding the race of so-called ‘English’ roses was to unite the robust growth habit and repeat flowering of the modern types with the flower shapes of the old. Unfortunately, Constance Spry, one of the first of this group, does not repeat flower. However, it is undoubtedly one of the most sumptuous of all roses, especially when – as in my garden – it is trained as a climber. I say ‘trained’. Loosely tied to a fence would be more accurate – the arching stems lend themselves to this relaxed treatment. At the moment, the buds are just starting to open into old-fashioned teacup-like flowers, a full 10cm across, clear pink and with one of the richest scents in the garden. The fact that the display lasts a mere two weeks can be forgiven, considering the freedom with which the flowers are produced (it is rather like Albertine in that respect, also flowering now). Another downside is that the leaves are already showing signs of blackspot. At the moment, that’s not too serious a problem – but I may get busy with the secateurs once the flowers have faded. 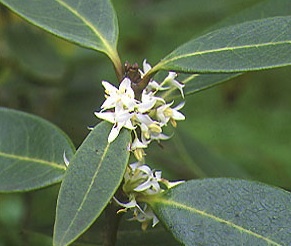 Readers of my January newsletter may well be wondering about Osmanthus decorus, the shrub I mentioned. This handsome evergreen is from the Caucasus, home of a great many garden plants, and I rate it highly, not only for its sweetly scented white spring flowers but for its generally understated style. As you can see from the picture, the leaves, presented flat, are substantial in texture but elegantly tapering – and unblemished by disease. They are somewhat similar to those of a rhododendron, but without the droop. And, also unlike the rhodos, this plant tolerates lime, with none of the yellowing of the leaves that can afflict some other evergreens. In a nice open – but sheltered – situation, the plant would probably grow as a neat dome. Shaded as it is in my garden, some of the branches are starting to stretch out uncomfortably, spoiling the shape. I’ll be giving it a prune to bring it into line after it has flowered.